Graco has long been known as one of the premier suppliers of high-quality strollers, playards, chairs and more, all targeted primarily towards parents of toddler-age children. 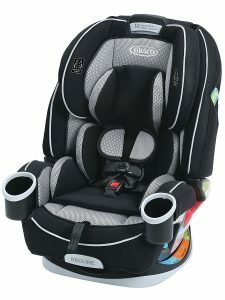 They also happen to manufacture special child-sized car seats, and like the rest of their lineup, these are all made to a very high standard of quality that suits Graco’s reputation. However, due to the large amount of products, all of which look largely the same—they are seats, after all—it can be a little difficult for the average buyer to choose the one that’s truly best for them and their child. This is why, in the following, we’ve assembled a compact, easy-to-read list of the very best children’s seats that Graco has to offer. 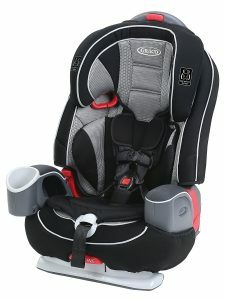 Here are some best options from Graco convertible car seat. This nice little contraption safely occupying the mid-end of the child seat market is branded as a 3-in-1 seat, meaning it can adjust for three different ranges of body size depending on the child’s age. In its minimal, barebones setup, it’s a ‘Group 3’ by law—it repositions your child on the seat so that the adult-sized seatbelt reaches properly and holds them tight, nothing more. However, by adding one or more of the modular parts, you can easily transform it into a ‘Group 2’ or ‘Group 1’-type seat for younger occupants. For that, the Nautilus packs its own, toddler-friendly five-point seatbelts. Fully assembled, it includes a full back and headrest assembly, and can even be adjusted using a simple three-position reclining system that’s easy and simple enough so that the occupant can use it themselves without any problems. There’s a built-in rigid cupholder in the right armrest, too. Thanks to high-grade materials and the modular, three-piece design, cleaning becomes as easy as possible, and there are hardly any spots that are truly tough to reach. However, the Nautilus isn’t for everyone. First of all, the mounting process can be quite a chore since it involves quite a few more screws and bits than we would have liked, in addition to the questionable installation process required to get all the straps and belts into place. As such, it’s best left where it is once you’ve managed to build it up. Also, despite optimal safety ratings, some of those aforementioned buckles and straps aren’t quite as tight as we would like them to be by default. 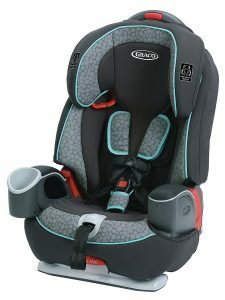 All in all, if you can gloss over some minor problem areas where we wish Graco would improve some in the successor model the Nautilus is destined to get at some point, this is a car seat for children of (nearly) any age, which alone makes it an incredible proposition due to sheer value alone. Add to that quality construction and some nice tricks here and there, like the reclining function, and we’re sold. No, you have not traveled in time; the true successor to the Nautilus, free of all the original’s admittedly few and minor flaws, has not been released yet. The LX model is something else entirely: Though based off of the standard Nautilus, it incorporates some ‘Not for everyone’ features that didn’t make their way into the original, and are now offered side by side with it for those who require them. One of these newfound features is a redesigned latch system. True, this might not sound that radical or that interesting, but it changes the tension with which the integrated buckles hold onto the occupant—if you remember, the belts’ lack of a proper hold was something we mildly criticized on the regular Nautilus. Does the new system fare better? Yes, if marginally; you’re unlikely to notice the difference if you’ve already used a regular Nautilus for some time. However, and much more importantly, the LX now includes a much easier, built-in mechanism for tightening (or loosening) the straps, so the out-of-the-box feel becomes much less important. Just have your child sit in it for a few minutes, adjust to the perfect tension, and you’re done! Besides this change, the LX is almost identical to the Nautilus 65, with the exception of some different stitching, optional color combinations, a slightly larger weight tolerance and further minor details. Despite these changes, the price of the LX is barely $20 higher than the regular model, making it a perfect deal, too. However, all of these minor improvements put aside, the LX still doesn’t address some of the Nautilus’ more head-scratching shortcomings. Still, it’s way too much of a hassle to assemble the thing properly, and still, we feel the whole contraption is built to be a lot more complicated than it perhaps should be. Why pay $20 more when you can get (nearly) the same product for less? In conclusion, if the standard Nautilus has been bothering you with some of its minor imperfections, or if you’re so put off by them that you can’t even consider buying one, then perhaps the LX variant is worth a look or two. It’s not a redesign in any way, in fact, it doesn’t change much of the formula already established by the Nautilus 65, but where there are improvements, they’re great, and the premium you have to pay for them isn’t that big, after all. Still, it remains a Nautilus, and we do hope Graco does, at some point in the future, come up with a true successor that will leave this design in the dust with its innovation instead of trying to improve marginally on old ideas. This is the next step up in Graco’s model lineup after the Nautilus and its variants. It’s as deluxe of a child car seat as you can get, which is obvious just from the looks alone, but if those didn’t communicate the 4Ever’s luxuriousness to you just enough, here are some numbers: $299. Ouch. However, unlike those more pedestrian seats costing half, or even a quarter as much—pun intended— the 4Ever was precisely designed to be something that could blow all of them out of the water: A truly universal child seat, fit for any age. It achieves this with a modified version of the Nautilus’ modular, reconfigurable 3-part seat system. Whereas the Nautilus always remained a booster no matter how much you put on or off of it, the 4Ever can be additionally configured as a rear-facing seats for especially young passengers. Its weight tolerance for elder occupants has also been generally extended to a maximum of 120 pounds. All in all, Graco says this makes it fit for up to a full decade of use! While the two cupholders make its silhouette more symmetrical than the Nautilus’, you will also happily find that Graco used the 65 LX’s seat belt assembly and latch system on the 4Ever, meaning it’s much easier to assemble and tighten than it might look. To top it all off, there’s a brand-new, 6-position reclining system, even more versatile than the one used on lesser models. Still, don’t underestimate the 4Ever’s bulk, weight or complexity, especially when all four parts are put together. It’s a big contraption alright, and definitely not meant to be disassembled that often. The insanely high price will also put off some, if not most of the 4Ever’s potential demographic. So, if you don’t think you’ll need something to move around, and if the price tag doesn’t bother you in the least, rest assured that the Graco 4Ever is one of the most feature-complete, most high-end child car seats available today, period. Besides its heft and the cash you’ll need to part with to enjoy it, there are few, if any flaws anywhere to be seen. It’s your call whether those $300 can really be worth it, though. We hope this little overview and review made the big picture of child seats and their many details, technicalities and legal quibbles a little clearer and more accessible. Now, we hope, you won’t have to end up scratching your head when shopping for this much of an essential piece of safety equipment for your child. And with that, we wish you good luck in finding one that suits your little one just perfectly!